"I canâ€™t imagine asking ourselves, "What does education look like?" Without first asking ourselves, "What do our neighborhoods look like?" If you had to introduce yourself to a complete stranger (i.e., me) what are the most important things they should know about you? I am originally from the Bronx and my family is from the Gambia, a small country inside of Senegal. Weâ€™ve been in NYC since we emigrated. I went to school in the Bronx through the 8th grade and then I applied and was accepted to a program for gifted students called Prep for Prep. The program prepares you to attend prestigious New York private schools and other similar boarding schools in the New England area. I ended up attending Choate, a preparatory (prep) school in Connecticut, for high school. Afterwards, I attended Harvard College where I started off pre-med, but eventually moved away from that path. What was going to prep school like? Going to prep school was the first time I had interacted with really high-income people. Iâ€™ll start from the end of my journeyâ€”at the very end I found my people, I became a lot more comfortable, I was doing really well academically, I was getting a lot of love and becoming very social. But at the beginning, coming from the Bronx, I wasâ€¦sad a lot of the time. At the time I didnâ€™t even realize how sad I was until I got older and started looking back. I remember going back to my room after class sometimes and just feeling so dumb. I would listen to people talk about the prestigious middle schools they attended and I remember comparing that to my middle school. I didnâ€™t have the cultural, social, or financial capital to feel at ease. I felt so uncomfortable, to the point where I didnâ€™t tell anyone outside. I tried to get through it. I was smart, Iâ€™d been smart all my life and thatâ€™s what had gotten me through tough times. I was fatigued and didnâ€™t know anyone who was experiencing the same things. I eventually found people who were having similar experiences; at Choate we had the Choate Afro-Latino Student Alliance, called CALSA. That was home. I loved it so much; thatâ€™s the only way I got through. How important do you think finding affinity groups, like you did, is to helping students who might not feel at home feel more at ease? Obviously, peopleâ€™s identities have different facets and race is just one of them. The BSU (Black Student Union) might not be for you, even if you identify as black. Not everybody needs the same medicine. It worked for me, and I was coming from a very particular context, but for other people, it might not be where they feel most comfortable. I do think as a first-gen student, you cannot afford to go through college without a sense of community or finding other like-minded people. Nuha sitting on a panel for the Harvard Foundation on Intercultural and Race Relations. Can you talk a little bit about your first-gen background? My parents never had formal education. My mom said if she had to pick a grade to mark her education level it would probably be first grade. 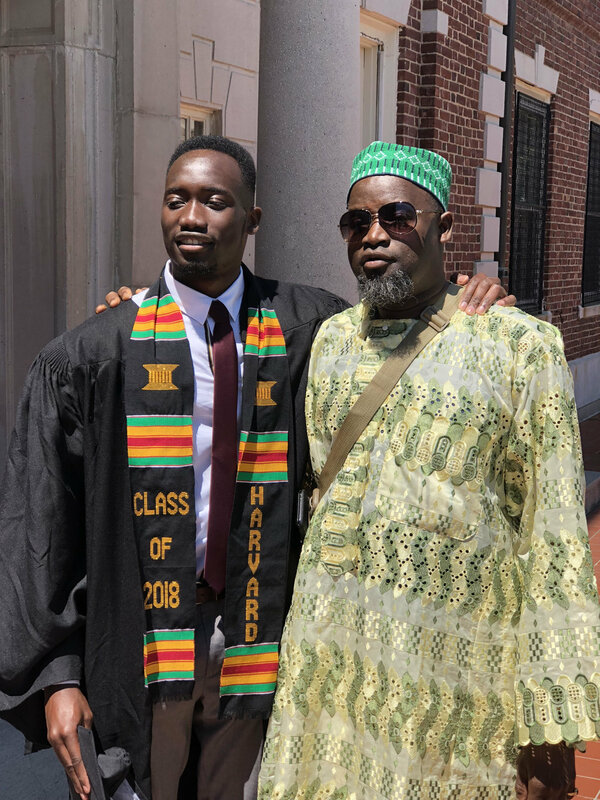 My dad didnâ€™t go to school either, he was a farmer back in Gambia. When my parents came here I just got sent to public schools in the Bronx. I went to three different schools; they werenâ€™t good schools or located in good neighborhoods. My culture is not necessarily like other West African cultures where school is a huge point of emphasis. Even when I got into Harvard my senior year of high school, my mom didnâ€™t know what it was. My parents emigrated 25 years ago and just wanted us to be in school. They didnâ€™t have these super high expectations. I got lucky to be blessed with teachers who saw potential in me and encouraged me to apply to these gifted programs. What is the role of teachers in shaping a studentâ€™s educational trajectory? I was actually just Facebook messaging Ms. Rodriguez, my middle school English Language Arts (ELA) teacher. She was the first teacher to ever give me an â€˜Aâ€™ in ELA. Iâ€™m a first-gen student, I grew up speaking my native language of Soninke and had to learn English as a second language; I started out in ESL (English as a second language) courses. Iâ€™d never had anyone believe in my writing abilities like she did. Along the way, as smart as I was, if it hadnâ€™t been for teachers like Ms. Rodriguez reaching out, I think I wouldâ€™ve continued being a smart kid, but I think I wouldâ€™ve lost my potential. They caught me at the those critical moments. I know I often kick myself for not having been aware of certain opportunities when I was 16 or 17 years oldâ€”do you ever catch yourself doing that? ALL THE TIME. In a way, youâ€™re always going to be behind. Itâ€™s something Iâ€™ve come to terms with. At every step, thereâ€™s something somebody else knows because of the resources they have at their disposal, that I just didnâ€™t. Iâ€™m just grateful that now I know and I can share that knowledge with other people. As someone who is so achievement-oriented, how do you stop yourself from ascribing pejorative meaning to those moments? How do you stop yourself from blaming yourself or thinking that your lack of knowledge is an indictment of your intelligence? Honestly, Iâ€™m just really confident in my commitment to go out of my way and learn things. In knowing that, when I do have those moments, I can safely say that I did all I could, I wasnâ€™t lazy, and it wasnâ€™t a lack of effort on my part. It was just a matter of resources and access to information. It used to bother me a lot, but now, itâ€™s okay. How do you go out of your way to learn things? I was actually just hanging out with my cousin and she asked me the exact same question. I feel like this is such a nerdy answer. Okay, so during the school year, I rarely read a full book, I skim the intro, conclusion, and maybe some of the middle and Iâ€™m okay. BUT during the summer, I take it upon myself to go back and revisit that material in the syllabus and do a deep-dive into it. Last summer I kept hearing the term, â€œneo-liberalismâ€� everywhere. People kept saying, â€œThis is what the neo-liberals are doing!â€� And I had no clue what that meant. I went on JSTOR and printed out this article called â€œNeoliberalism as Creative Destructionâ€� and I sat on the train as I went to work and read it. Iâ€™m very interested in certain theories, if I hear something I donâ€™t know, I will go and Google it. I want to know more. The way Prep for Prep works is that you rank your top 5 prep schools and then itâ€™s a matching process. Choate was number one on my list; when I visited, I just loved it. When I got in, I canâ€™t describe to you how excited I was. I have five sisters and my house was really crowded so I was happy to embark on this journey. When I got to Choate though, I never thought about going to Harvard. The people I knew at Choate who went to Harvard were so, so smart. I thought, Harvard and Yale are for those people who have been prepped since middle school. Those are the smartest kids and I never thought of myself like that, I didnâ€™t have that confidence back then. The school I wanted to go to was Syracuse in upstate New York because I thought I could get in. As part of Prep for Prep we did overnight college visits and when we went to Harvard I hated it. I thought it was fluffy; I donâ€™t like pretentious stuff. But then I had a great conversation about religion with the Harvard student who was hosting me and once I got in, the financial aid was CRAZY. I didnâ€™t think I was going to get in, it was ridiculous. Now that Iâ€™m back home after eight years of boarding school and college, I think about my childhood and wow. Where I am now, itâ€™s different, so different from what I had in mind. I spend time with the people who stayed in my neighborhood and remind myself of my privilege. I used to come back to the Bronx from Choate and blame peopleâ€”I think a lot of it was internalized racism. I used to be so judgmental. At Choate, I was living in a completely different world. The thing is, not everyone has had the privilege that Iâ€™ve had. I am cognizant of that. You canâ€™t expect the same type of thinking from everyone. I just donâ€™t want to run away from the place I call home as much as I did when I was fourteen. Nuha with his younger sisters at Harvardâ€™s commencement. From what Iâ€™ve read, youâ€™re passionate about public education reform. What was your experience in the public school system? What would you like to see change in our education system in the next couple of decades? I canâ€™t answer this question. I canâ€™t imagine asking ourselves, what does education look like, without asking ourselves what do our neighborhoods look like? What does city planning look like? Itâ€™s so frustrating because you can have good teachers, but context is everything. When I went to Choate for the first time I was floored. I had really bad asthma as a kid and Choate had 450 acres of land for a high school. It was the first time in my life when I could literally breathe. The air was just so much better. Nonprofits like Prep for Prep exist to serve their own end. As great as they are, I donâ€™t want nonprofits like this to exist forever, I think that would be horrible. We are sending kids out of these neighborhoods instead of working to build up our neighborhoods and schools. I interned for a company last summer called Ideas 42and got a return offer at the end of the summer. Ideas 42 is a nonprofit, behavioral science consulting company. It focuses on using behavioral economics to tackle different social issues. Long term (at least for now), I want to work for a while and get really good at understanding behavioral science and how to use it in different industries. Iâ€™d like to go back to school and get a PhD in health policy or public health. I think education is crucial, but I also think I could make a huge difference in the health field. What book should be required reading? I actually have twoâ€”one fiction and one non-fiction. Discipline and Punish by Foucault (definitely read the chapter on the panopticon), it teaches you to think about power differently. And Giovanniâ€™s Room by James Baldwin, itâ€™s so well written and really touched me. What do you do when youâ€™re lacking motivation? Walks are recharging. I used to be much more of an extrovert than I am. My thesis process taught myself to love myself a little more which is weird, but you spend so much time alone, and you have to learn how to recharge alone too. Whatâ€™s one thing on your bucket list? I donâ€™t have a bucket list, but Iâ€™d like to travel a lot more internationally. I learn something new about myself every time. Iâ€™d love to go to Morocco. If you could only eat one food for a year what would it be? African peanut butter stew. I hate how this translates, because I actually hate peanut butter, but itâ€™s so good. Who do you admire? I donâ€™t really have idols because weâ€™re all so imperfect. But Iâ€™d have to say my dad, he is the most hardworking person. I think I get a lot of my personality from him. Heâ€™s so calm, he makes you feel like things are going to be cool; I aspire to be that way.